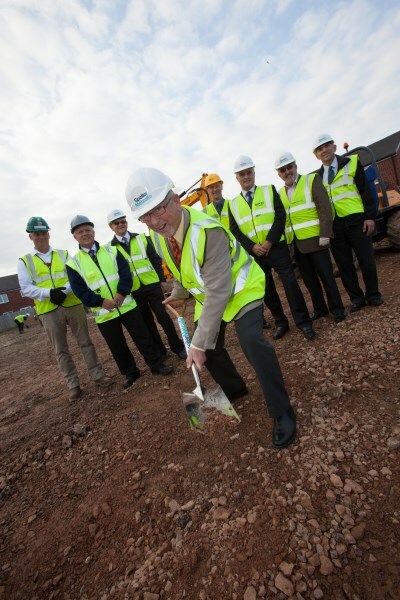 Work has now begun on a £1.08 million community centre at Coopers Edge. This is the latest new facility for this great location taking shape in Brockworth, Gloucestershire, where we currently have three exciting developments - Glevum Oaks, Centurion View and Imperial Place. A special sod-cutting ceremony attended by consortium and local authority partners marked the start of work, from where Jeremy Cook from Bovis Homes Western region, said: "This is part of our ongoing work to make Coopers Edge a fantastic community to live in and we're pleased to be working with a local business in Speller Metcalfe to deliver another key milestone in the lifetime of this project." Andy Metcalfe, Joint Managing Director at Speller Metcalfe explained how the facility will benefit residents: "The community centre is an integral part of any community and Coopers Edge is no different. "As a multi-functional facility, residents will have access to a sports hall with sprung floor for activities like indoor football and badminton, as well as a kitchen area, café and meeting rooms and Speller Metcalfe is delighted to be a part of this project as a contractor based local to site in Brockworth itself." The project on behalf of Bovis Homes, Barratt Homes and Persimmon Homes follows other local initiatives to enhance community living at Coopers Edge, including Coopers Edge Primary School, numerous public open spaces and play areas, and is due to complete in June 2015.